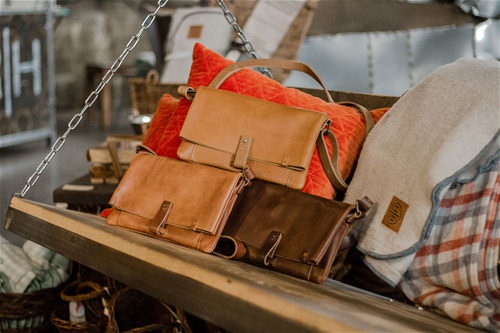 Rustico handcrafts original, high-quality leather products and more rustic gear. When you choose a Rustico item, you get a unique piece skillfully built from raw materials that will inspire you to step outside, explore, live intentionally and leave your mark. Proudly made in the USA. We’re excited to announce our 2019 Winter Show Specials exclusive to show attendees. All orders must be placed by March 15th and must ship by March 29th, 2019. Show specials are exclusive to show attendees and for more information, contact our Brand Specialists by visiting our booth at 3-2-CTR4A or email us at wholesale@rustico.com. Designed to withstand the demands of any creative project, the Journeyman Waxed Canvas Apron holds strong from the garden to the workshop. 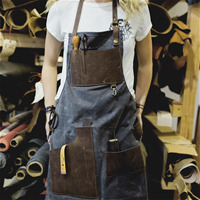 Durable waxed canvas complemented by top-grain leather straps and pockets allow this apron to embrace the marks of your trade without compromising quality. Sometimes leaving your mark requires a little more pages. 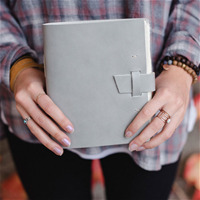 For committed writers, the Good Book supplies more pages, a sturdy hand-stitched binding, and a convenient carry size. We crafted it to go the distance, so fill it with a journey. The journal that started it all. 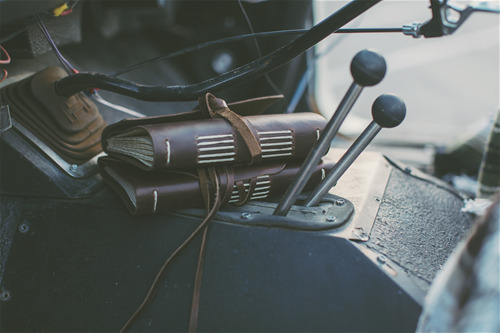 Our founder, Isaac Childs, crafted the first Traveler as his personal journal. 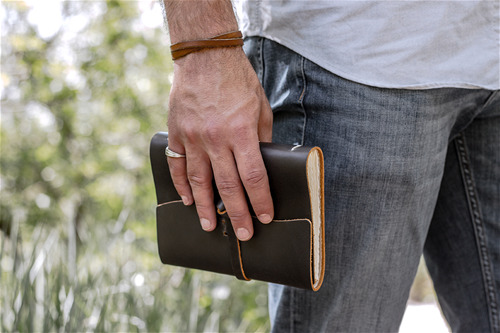 He needed something travel ready, a journal tough enough to make any trek. 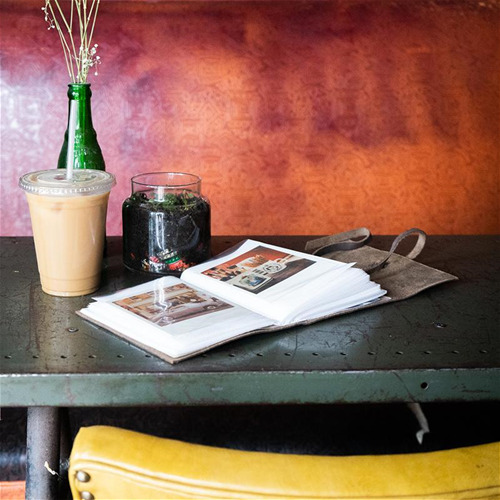 The traveler journal represents what Rustico is all about—exploring and creating. 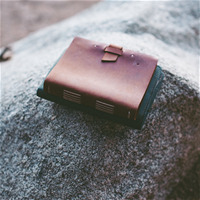 So get out there and take a trek, use the traveler to memorialize those most important moments, your journal will be with you every step of the way. 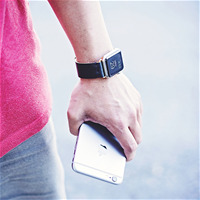 Personalize your Apple Watch with the premium Epoch Apple Watch Band. 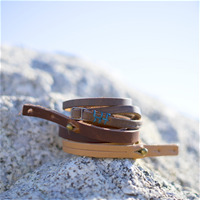 Handmade by our local artisans from raw top-grain American cowhide and hand sewn with waxed linen thread. Choose from multiple leather colors and hardware to compliment a variety of Apple Watch Faces. 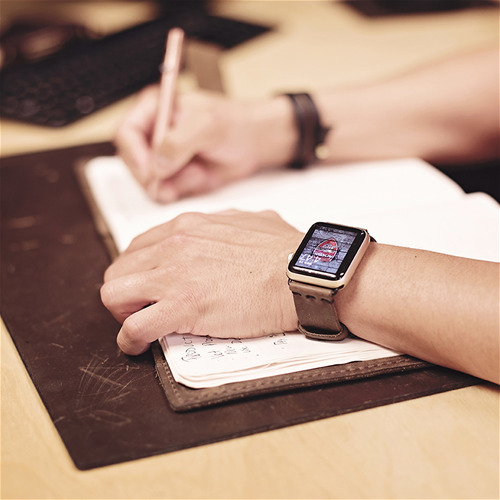 The Epoch Watch Band balances the swiftness of time with the steadiness of leather.Personalizeyour Apple Watch with the premium Epoch Apple Watch Band. 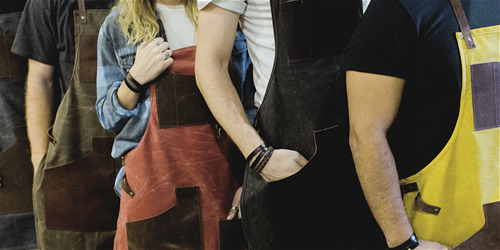 Handmade by our local artisans from raw top-grain American cowhide and hand sewn with waxed linen thread. Choose from multiple leather colors and hardware to compliment a variety of Apple Watch Faces. The Epoch Watch Band balances the swiftness of time with the steadiness of leather. 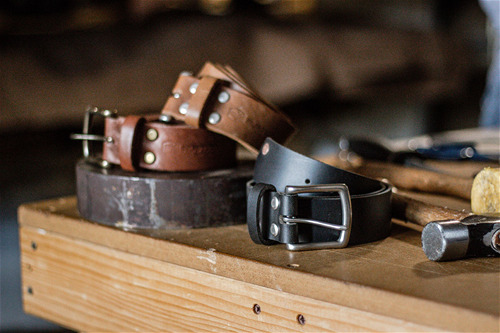 Meet the stylish Rustico Men's Leather Belt with matte nickel or antique brass hardware. Strong, attractive and minimal, the belt is made to last the test of time. Sourced from North American hides and made in the USA. Its Chicago Screws allow for buckle customization and offer superior durability. As with all of our products, we ensure the highest quality materials and craftsmanship. 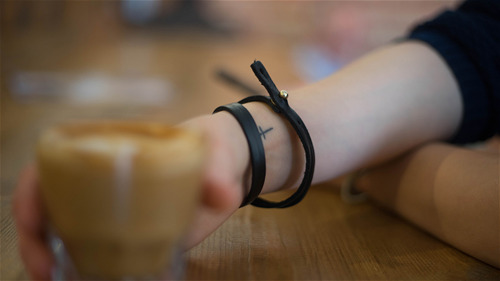 Accent any style with the perfect leather wristband or bracelet. Several designs to choose from to complete any outfit. 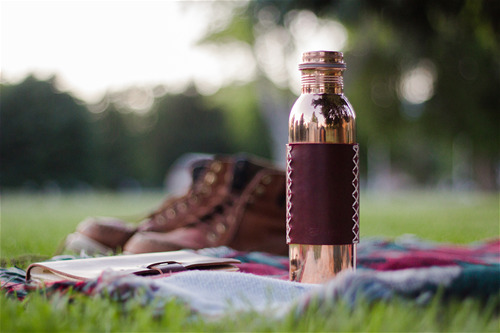 Inspired by mineral-rich mountains and the adventures they hold, the Phoenix Copper Water Bottle brings together natural health and quality craftsmanship with every cool sip. 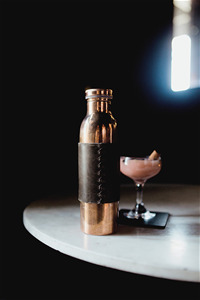 Wrapped in a hand sewn 3-piece leather sleeve this bottle is a perfect companion for your journey. We've taken ten years of lessons and feedback on our other travel wallets and turned them into what you see here. The Grant Leather Travel Wallet provides all the essential real estate needed for the international jetsetter. Safely secure your passport in the main compartment along with cards, boarding passes, and money in the other pockets. 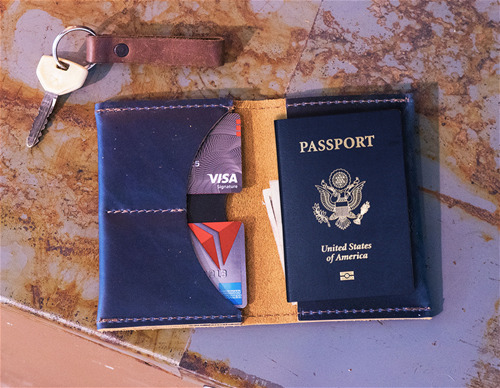 This wallet comes debossed with custom globe artwork and is handmade from top-grain leather. Enjoy adventuring! It took a little invention to create the most functional wallet in the Rustico arsenal. The Money Clip features a wire clip mechanism that conveniently holds cash and would make Samuel B. Fay* proud. It also provides two different places to store cards. As one of our most loved pieces, you may see someone whip this out from time to time. 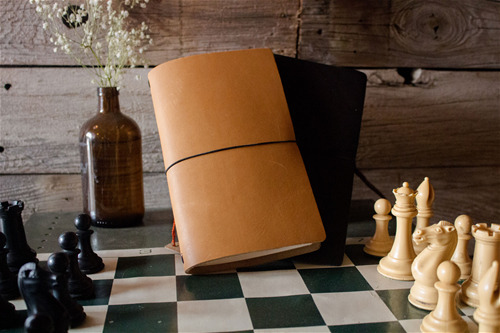 Every minimalist needs this refillable leather notebook. Top-Grain Leather. Dot-grid paper. Elastic. That's it. Simple yet functional.​ Great for bullet journaling needs. Carry your favorite bottle of wine safe and sound to any restaurant, dinner party, or friend’s house in our elegant, new Napa Wine Tote. 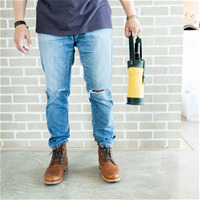 Named after the notorious wine valley in Northern California, this accessory is a handcrafted blend between thick, strong waxed canvas, antique brass hardware, and authentic, top-grain leathers built for those who enjoy a fermented beverage. It’s the ideal carry for any BYOB invite. We'll drink to that! 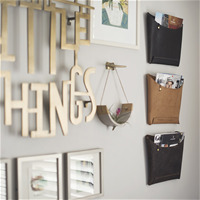 Crafted with rough-cut American cowhide and rich in mid-century charm, the Leather Wall Pocket is a natural storage solution for paper, mail, magazines, and office supplies. Hand sewn with the strength of seven chord Irish-waxed linen and secured with sturdy brass rivets. 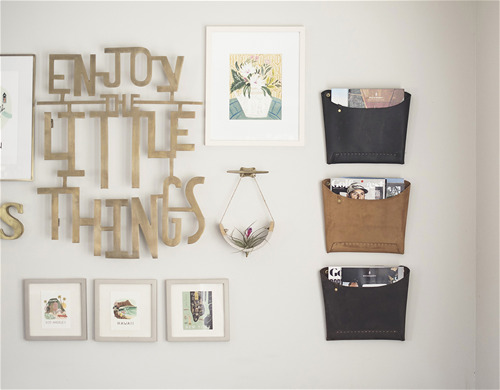 Mount one or in multiples for an attractive piece of functional art at the office or home. 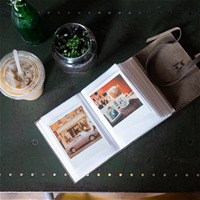 One of our best-sellers for a reason, the Journey Photo Album holds up to 100 4 x 6 photos. An old-world style flap-tie closure gives this album a great look. Conveniently document your favorite experiences in our elegant and durable exclusive top grain leather. The album includes slip-in pockets and can be personalized with a name, date, or phrase for that special finishing touch. 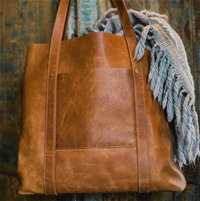 Beautifully handcrafted, the Habitat Leather Tote is designed for a lifetime of getaways. Natural full-grain leather in simple design allows this piece to support daily carry demands as well as sojourns across continents. 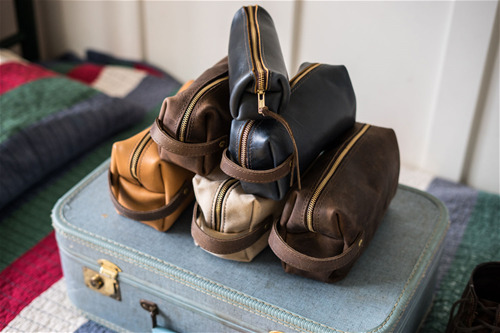 Flat leather handles, an open top, and two large pockets are well suited for both finding keys and toting blankets. 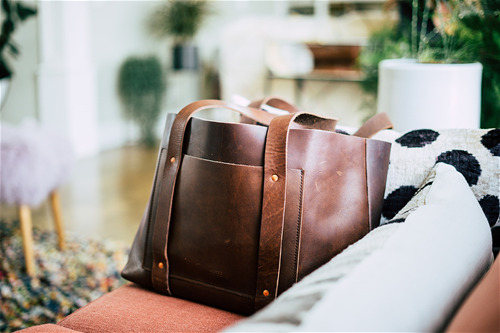 Inspired by cozy mountain cabins and breezy tropical bungalows, the Hideout Leather Tote confidently stows blankets and novels or sandals and yoga mats. 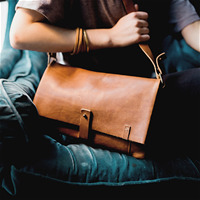 Handcrafted with large pockets, flat leather handles, and a wide-open top. This gorgeous piece is the perfect bag for anywhere life takes you. Inspired by cozy mountain cabins and breezy tropical bungalows, the Hideout Leather Tote confidently stows blankets and novels or sandals and yoga mats. 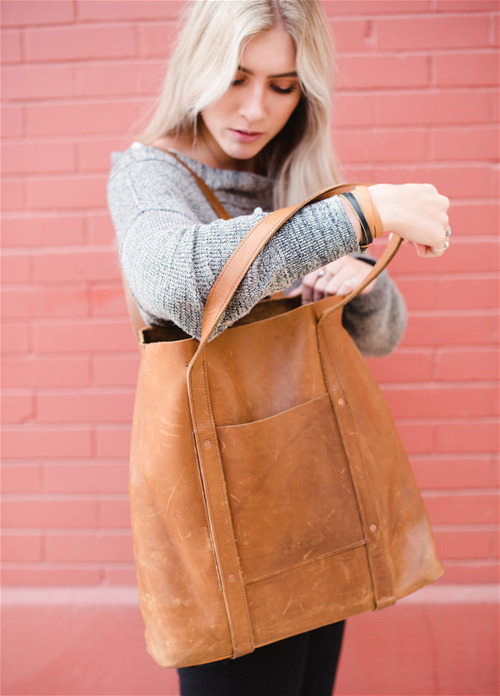 Handcrafted with large pockets, flat leather handles, and a wide-open top. This gorgeous piece is the perfect bag for anywhere life takes you. Naturally softening and evolving with use, the Parcel Fold-over Clutch is handmade with full-grain leather. Crafted with large pockets, an adjustable shoulder strap and a simple fold-over closure, the Parcel is designed to naturally bundle essentials around town. 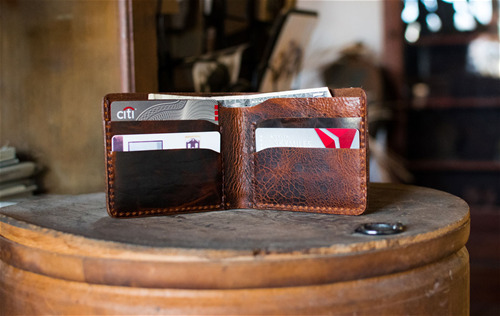 This traditional men's bifold wallet comes crafted in tried-and-true rustic design. 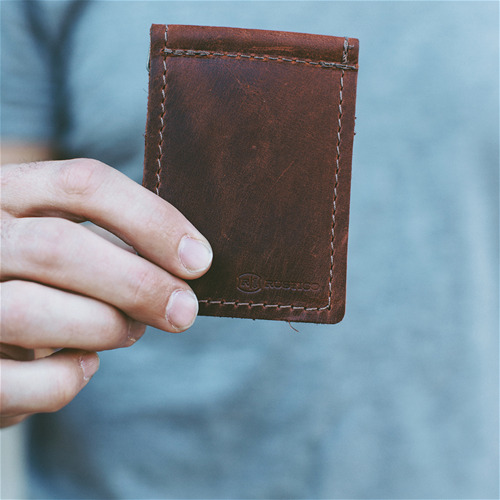 Handcrafted with handsome, top-grain leather, it includes 4 interior credit card slots and 1 full bill compartment for your cash and receipts. Designed slim to consume minimal pocket space in either the front or the back pocket. 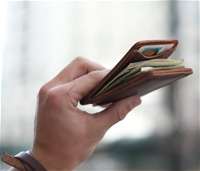 This is the wallet you'll pass down generations.